MathRider » Blog » MathRider Version 4 is Here! All narration has been re-recorded and more than 100 new narration recordings added. 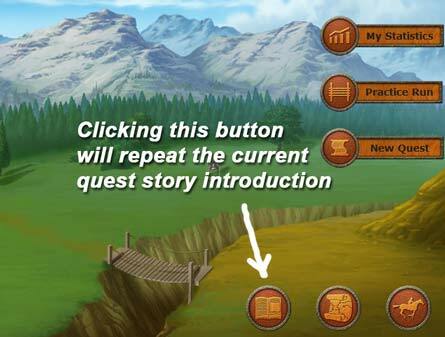 Stories now connect more to the quests and encourage players to keep repeating each quest until mastery has been achieved. Added a lot of new humour into the storylines. Questions that were failed to answer do not ALWAYS get repeated as the second-next question. The medium difficulty quests now require 750 points to finish (used to be 800). The master level quest now unlocks only at 100% mastery level (used to be 99%). Fixed a problem where the original answer time was sometimes not being recorded properly in database. This affected the calculation of rate of improvement for players. Fixed problem in practice mode when a large number of questions could potentially hang the game. Every story now takes the player on a journey that repeats until they master the quest at 100%. 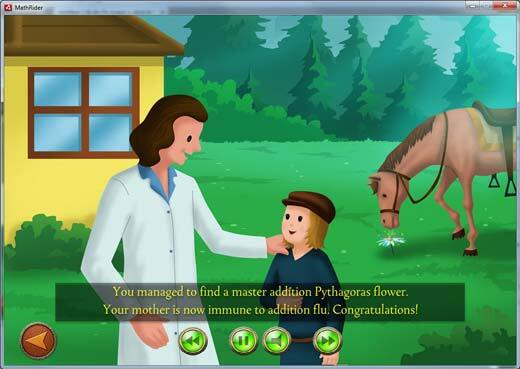 For example, in the easy addition quest, the player mother will keep getting addition flu until the player finds a perfect addition flower. That only happens when the player has reached 100%. 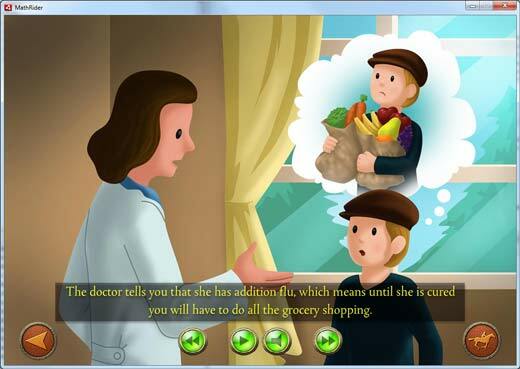 Until that time, the mother will keep getting the flu – with various consequences that the entire family should be able to relate to :-). 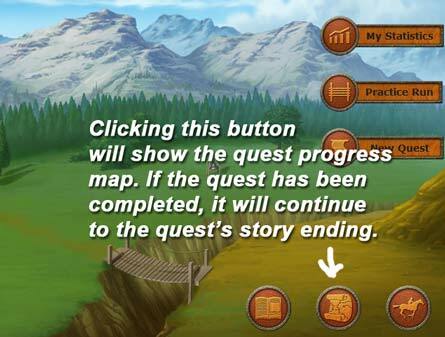 When you first upgrade your Version 3 installation of MathRider to Version 4, the stories will initially play out as if the player had never played the quests before. That is because we need to set up the new story premises within each quest line. Once the players start repeating the quests, the storytelling will reflect that – at times with rather funny consequences – but always trying to encourage the child to get closer to mastery. This is entirely based on feedback from a dad of one very clever boy. What the dad told us was that his son had worked out that if he fails to answer a question correctly and the obstacle reaches the horse, that same question will get repeated as the second-next question. So his son (very cleverly) would simply make a mental note of the correct number to key in and not even look at the question anymore when it came. This of course defeated some of the reinforcement we were aiming for. So to counteract this, we added a bit of randomisation, so that an unanswered question only gets repeated as the second-next question 80% of the time. That should be enough to throw this kind of heuristic. – Sorry, young man! Other feedback we received was that the quests were taking too long for some kids. Given that MathRider version 4 has much better variety in the stories, it made a lot of sense for us to shorten the quests a bit, too. Thus we shortened the medium quest by 50 points – now players only need 750 points to reach the elven city. Similarly, the advanced quest used to require 900 points from riding. Now it is only 800. If your child is playing one of these quests at the time of upgrade to MathRider version 4 and already has 750+ or 800+ points respectively, the quest will simply play out with the old score requirements. Otherwise, the new score requirements will immediately apply. The biggest issue we found that due to an invalid data structure, the game was unable to measure improvement of some questions for players. That has been fixed and all questions should now reliably show the correct percentage of improvement over time. Phew!! We also fixed an error in generating questions for the practice runs that could result in the game hanging when a large number of questions for a small number range was selected. Of course, you can also contact us directly for any question that you can’t find the answer for, feedback or suggestions. We’ll be only too glad to help in any way we can! That brings me to the most important part of this post – your opinion. What do you think of this latest update? Are we going in the right direction? What would you like to see next in MathRider? This entry was posted on Saturday, June 23rd, 2012 at 2:51 am	and is filed under Announcement, News. You can follow any responses to this entry through the RSS 2.0 feed. You can skip to the end and leave a response. Pinging is currently not allowed.